A typical tale of dungeon crawling, with all the nasties, plenty of fighting, magic and questing adventurers trying to stop a looming doom. It's done well, each book can be read as a standalone but fits in in a whole story ark. Like the characters, Ridmark seems to be learning to except his losses and take comfort from his companions. The next one sounds to be as good. We are almost there or to get to the conclusion. For me next to RA Salvatore, Robert Moeller is the finest EPIC Fantasy writer ,with R Jordan a close third. 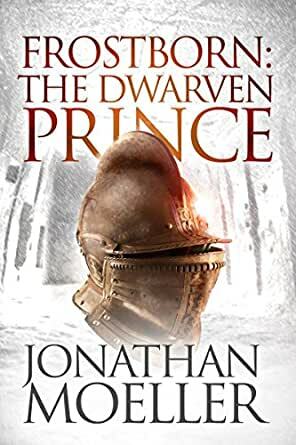 The dwarven prince is the continuation of the ultimate invasion of the Frostborn. The main characters are still here with all there strengthens & vulnerabilities. He has kept my total interest through 12 books & I look forward to the last three.This series is great & all fantasy lovers should read it! 4.0 out of 5 starsA great series! I have really enjoyed this series, a remarkable tale featuring a flawed but indomitable hero, a heroin of great heart and a wonderful band of warriors surrounding them. The story is vast and involving, the battle scenes are really well written,(and battle come frequently in this world) and the characters are well developed and relatable. Add to that, the author has planned and plotted this epic to the end,(unlike another author I could mention who leaves his readers hanging for years and let's TV writers take over his story.) What more could you want? This author likes to write long book series, only marginally advancing the plot with each installment. That being said, each book is engaging, he writes at an incredibly fast pace and the price is right. I feel I received good value for money here. I'll buy any new book Jonathan Moeller writes, a status that I do not give to many authors. 4.0 out of 5 starsA fine read and a good series so far. The saga continues and the hero just survives to fight another day. The story lines are a little repetitive but it does not really matter as you follow the story and just enjoy it. Great to find a series with so many books and with more to come. Also nice to have the author write the next book so quickly and not wait years for the next in the series to appear.